Please be certain to secure your reservations for this year's annual awards luncheon. Student scholarship winners are able to attend the ABE Lucheon at no charge. The student scholarship winner will receive one guest ticket at $25.00. Please include student name with guest name reservation. 10 guests per table maximum. ABE offers Sponsorship options to our Supporters allowing for a greater level of support for the Arts, Business and Education Community. Please visit our Sponsorship page for more information and to see current sponsors. Join us at the 40th anniversary celebration performance with the Face Vocal Band concert at the new ENT Center for the Arts. 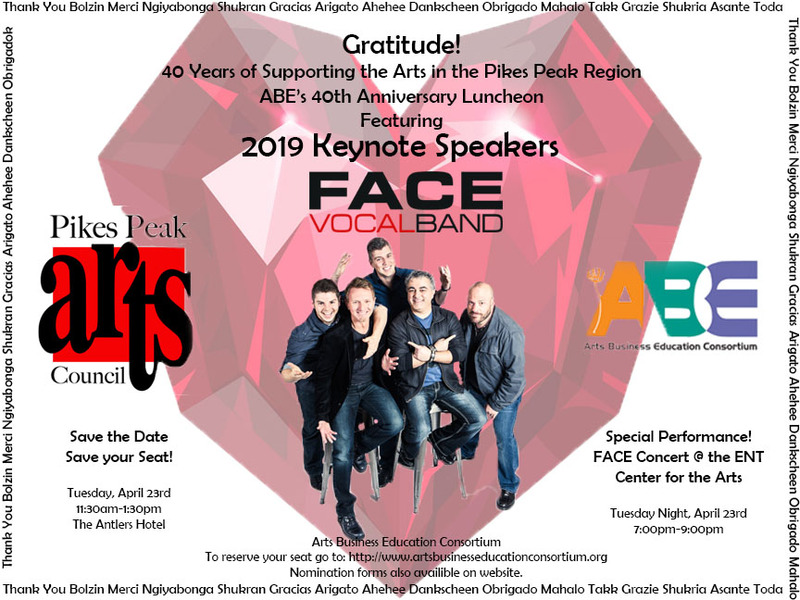 If you purchased a luncheon ticket, use the discount code ABE2019 for a $10.00 ticket, just use this link to the UCCS Presents box office. The Arts, Business, Education Consortium honors those local areas educators, businesses and community supporters who contribute significantly to the arts in education.